"Axl brought his voice to it. Like, it was staggering. I thought he did an amazing job. I could hear him very clearly, and it’s the best I’ve ever heard the band." Having sat behind the kit with some the biggest names in music including Jimmy Page, Tom Jones, David Gilmour and Gary Moore, Chris Slade has had a remarkable career. 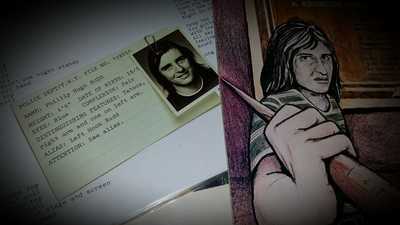 It’s his time with rock titans AC/DC however that dominates his story. Joining Angus Young and co for career revival album ‘The Razor’s Edge’ in 1990, his services were called upon once more when original skinsman Phil Rudd found himself in a spot of bother in 2014. 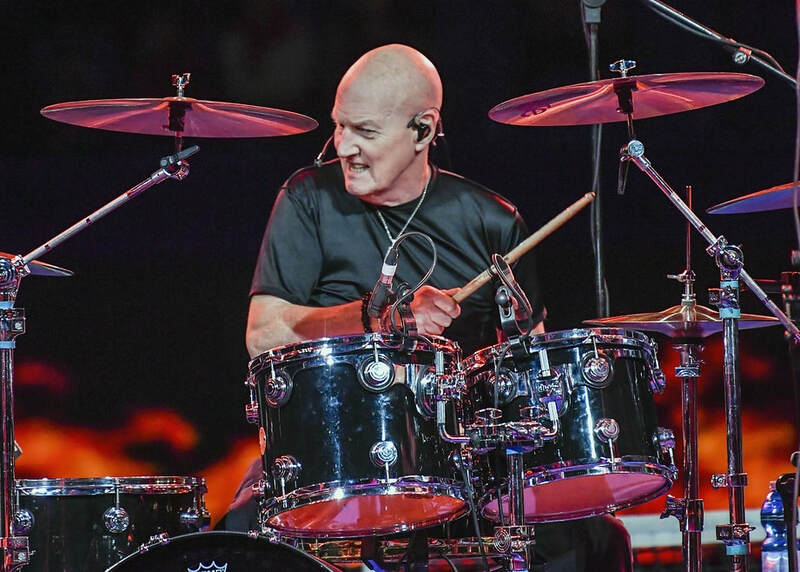 Now touring regularly and celebrating his discography with The Chris Slade Timeline, we caught up with Chris for a chat about all of the above. Thunderstruck; Eamon O’Neill. Hi Chris, how are you today? I’m pretty good, thank you. I’m surprisingly well, actually! I’m terribly, terribly healthy, if that isn’t a contradiction of terms! You’re been on the road with the Chris Slade Timeline since the summer; how has that been? It’s fantastic, actually. This may sound a bit like we’re blowing our own trumpet, but we never have a bad gig. It’s very surprising. We’ve been going for about five years, and we’ve did things like Hellfest, which is the biggest European music festival, like 50,000 people or something. That was a particular highlight, but we’ve done other festivals also, and everything else smaller than that, and it’s been just fantastic. We can play up to two and a half hours, and when we announce the last song, everybody just groans; they don’t want it to stop, and I’m being serious here. So, I’m very, very pleased with the band and the way things are going. The band plays an incredible mix of material from right across your career; some people might not realise that you played with David Gilmour, for example. Yeah, I was with Gilmour for a full year actually in 1984. That was a great band. Raph Ravenscroft was on sax, and Mick Ralphs from Bad Company on guitar, and everybody was at the top of their game. That was a great experience. The list of names you’ve played with is just jaw-dropping; does it amaze you to look back at your own catalogue? Yeah, absolutely! I do look back, and I have quite a long way to look back now, but I just feel so privileged, to be honest, to still be going. I didn’t think I’d make it past fifty, to be honest, as we all do when we’re younger – “I’ll be gone by then!” you know? But, apparently not! Of course, you’re most well-known from your time with AC/DC; what do you remember about your audition for the band in 1989? I did the audition along with a hundred other, might I say, top players. I won’t give you any names, but some of them are household names, as far as drummers are concerned. I was the hundredth drummer that they tried out over quite a few months, and to cut a long story short, I didn’t think I’d done very well at all. I drove home, and I got lost because I was so preoccupied, and it was only an hour from my house. I was berating myself driving home; “Well, why did you say that? Why did you do that?”, and when I got to my house, my wife come up the path and said; “How did you do?” I said; “Really badly. I don’t think there’s much chance of that”, and she said; “They’ve just called to say you’ve got the gig!” [*Laughing*] So they called before I’d even got home. How long was it after that that you began working with the band on ‘The Razor’s Edge’? ‘The Razor’s Edge’ was AC/DC’s most commercially successful release in almost a decade; did you feel at the time that it was going to be something big? To be honest, no, not really. I don’t think anybody does. Whenever you make an album, you cross your fingers and hope it’s going to turn out the way you hear it in your head. There had been times in the past where I’d known it was going to be a hit record; one was with Tom Jones ‘It’s Not Unusual’, and the other was ‘Blinded By The Light’, with Manfred Mann’s Earth Band – we all absolutely knew that those were hits. But I had no indication, and I don’t know if the guys did, that ‘Thunderstruck’ was going to be the huge thing that it was. It put the band back up into the mainstream to where they are today, which is as arguably, the biggest band in the world. What do you remember from the recording session; were you all recording at once, or were you tracking different parts at different times? The band always, no matter who the drummer is, always plays together, all the time; take after take after take after take, all day long. That’s what they do. We probably played ‘Thunderstruck’ for days, as with all the other songs on ‘The Razor’s Edge’, with Brian [Johnson] singing every song as well, by the way, every time. So, we’re in the studio, together, all playing together. And that’s the way they work. They always have done that, and they always will do that. That’s the way they do things, and obviously, it has paid off over the decades; they’ve still got that. Some bands don’t even talk to each other, don’t even see each other; the drummer puts it down, then the bass player comes down a week later and puts his parts down. It works like that in some bands, but with AC/DC they’ve always played together in the studio, every single take. There are some great tracks on the album, not least the title track. Yeah, absolutely, and we play that; it goes down so well with Timeline. I was surprised. The band, Timeline actually persuaded me to do it. I thought; “Nah, I’m not so sure how it would go down”, and the guys were going; “This song is great, and we’ll do it great justice”, and then when we played it, it was like; “Wow, yeah, we’ve got to do this”. Were there any songs from those sessions that weren’t used and are still in the vaults? Yeah, I think there were a few left over. There weren’t many, but there were a few left over. I’m trying to remember – it was quite some time ago! We did almost all of the album in Dublin, by the way. For one reason or another, we took the tracks to Canada, and Bruce Fairbairn took over as producer. But we spent weeks in Dublin to start with. The Dublin sessions were like, demo time, if you like, but a lot of the tracks were used. It was down the docks; Windmill lane. So that’s where we demoed, and then went on to Vancouver, which is the definitive sessions, if you like. Your time in the band came to an end around 1994; how did you find out that you were out of the band, and that Phil Rudd was coming back? I got a phone call from Malcolm [Young], actually. I’d been doing demos with the guys in London; Angus, Malcolm, and myself. Mal was playing bass, and Angus was playing rhythm – no lead guitar, just rhythm guitar, which seems very strange, because Malcolm, being one of the greatest rhythm guitarists ever. But he played bass in these sessions, and that went on for weeks, and they were writing as they were going along as well. I thought; “Well, the guys are in the studio and I wouldn’t mind playing drums”, and I put that to them, and they said; “Yeah, come along”, so that’s what I did, again, for weeks and weeks. I’m terrible with titles, but it was for the next album that came out [1995’s ‘Ballbreaker’], and I demoed every track for that album. So you played on all the ‘Ballbreaker’ demos? I know this is a fact, because after I’d left the band, I went to visit Cliff and Brian. I went to have a pint with them, and they were all in the same apartment complex, and I said; “Oh, where’s Phil [Rudd]?” This is after he’s back in the band, and they said; “Oh, he’s upstairs”, and I heard him playing, learning my drum tracks, which is a turn up for the books, because I usually have to learn his tracks! So, he played my parts that I had demoed for the next album, so that was a little bit of satisfaction, actually. So, I got a call from Malcolm saying; “We’re going to try Phil out. Apparently he’s straightened himself up, and we’re going to try him out”, and I went; “Well, I’m gone then, Malcolm, Thanks very much, but…”, and he said; “No, no, we want you to stay on; we don’t even know if he can play drums anymore, because it’s been a while”, and I said; “And you’re going to try him out? !”, and he said; “Yeah, well, we’ve talked to him”, and I said; “Well I’m gone, and if he can’t play drums, that’s your problem now, Malcolm”. And he said; “No, we’ll keep paying you”, and I said; “I don’t care”. And that was it, I resigned, right there and then. It sounds like you weren’t too happy about that. No, I wasn’t. After that I didn’t touch a drum stick for three years. It just knocked me back. I thought, you do your best – as I always do, as I always have – and it’s not appreciated and I thought; “I’ve had enough of this business”. 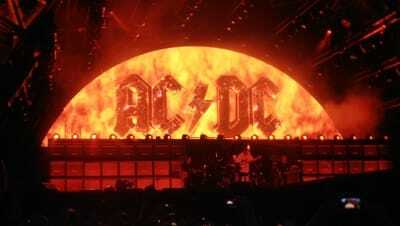 Fast forward to 2015, and were you surprised to get the call from AC/DC to re-join the band once again? I was not surprised, I was shocked to get that call, especially after the way it ended before. I was very pleased to get it. I was actually working in Switzerland that night with Timeline, and I got the call from the manager. It went on for about twenty minutes. In fact, I was late for the gig because of it. At the end of it, after a fifteen minute conversation, I said; “Does this come from all the guys form the band”, and he said; “Oh yes, definitely”, and it was. So it was amazing, especially with my age; I was late-sixties at that time - so was Brian, by the way! But it was fantastic, and the tour was great. It always has been a great honour to be in that band. What was it like with Axl Rose fronting AC/DC, and the shake-up of set list that came with it? That all came from him. I was standing right next to him when he said to Angus; “Do you think we could do ‘Live Wire’ and ‘Riff Raff?” And Angus said; “Well, we don’t know them right now, but we’ll learn them”. I love playing ‘Riff Raff’, and I’ve never stopped playing it, even when I was working with like tribute bands or something. It’s one of my favourites actually, to play. Do you think Axl fronting the band reinvigorated things somewhat? Yes, absolutely. Angus was running around like a schoolboy, you know?! [*Laughs*] Sorry, I’m cracking myself up here! It did reinvigorate the band. Brian is great, as we all know; he’s a great personality and a great guy. Axl brought his voice to it. Like, I couldn’t believe the notes he hit; it was staggering, and I actually had no hope at all, when I heard that Axl was going to be in the band. I though; “Oh, what? !”, because I’d only ever heard that Guns ‘n’ Roses voice, but all great singers, they can change the timbre of their voice, and wow, he hit notes that dogs can only hear. It was unbelievable! I thought he did an amazing job. I could hear him very clearly because I use in-ear monitors, and it’s the best I’ve ever heard the band. It seems from press reports, that four fifths of the ‘Back In Black’ line-up is recording again; with the exception of who is on the drum stool, do you agree that that’s how things should be right now? Yes. If it works, good luck. It’s great. And why not? There’s all sorts of rumours; Axl’s going to be doing a track, Brian’s going to be doing a track; there’s so many variables here. 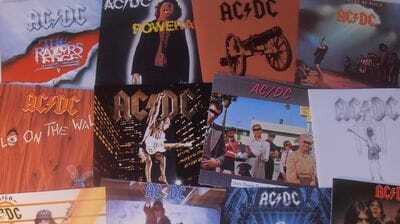 And I’ve learned with AC/DC also, not to believe the rumours, because even fans fake things; things just get faked. But Angus is now over sixty, I think, so he’s still got a few years to go, if you go by me and Brian. That’s all he does; he relaxes by painting, and he smokes fags, and that’s about it, so the rest of the time, he’s playing guitar. Finally, if you were a betting man, who would you say is playing bass on these sessions? The Chris Slade Timeline play Dublin's Button Factory on Sunday 11th November 2018. For tickets, click HERE. For upcoming shows, and more, visit the Timeline's Facebook or Official Website. EXCLUSIVE: In And Out of AC/DC, Phil Rudd Talks 'Head Job'. RANKED: The Top Ten AC/DC Albums. AC/DC & Axl: Flick Of The Switch, Or Blow Up Your Video?